It’s early 1927 and Babe Ruth just can’t catch a break. A few months earlier, the New York Yankee superstar—some argue sport’s first—commits a boneheaded error in judgment, getting thrown out at second base attempting to steal, bringing the 1926 World Series to an abrupt end in favor of the St. Louis Cardinals. Now, in what seems an even more egregious error, he finds himself dragged into the Long Beach Police Department, the greatest athlete of his time accused of skirting child labor laws with an 8-year-old girl. Her parents are upset. The DA is livid. This could ruin his reputation. But Ruth has also got a vaudeville act to get to over at the State Theater on Ocean Boulevard, and the audience is waiting. All the while, Ruth reeks of booze and trout already consumed during the day on a fishing trip. Any of this ring a bell? For most people, no. 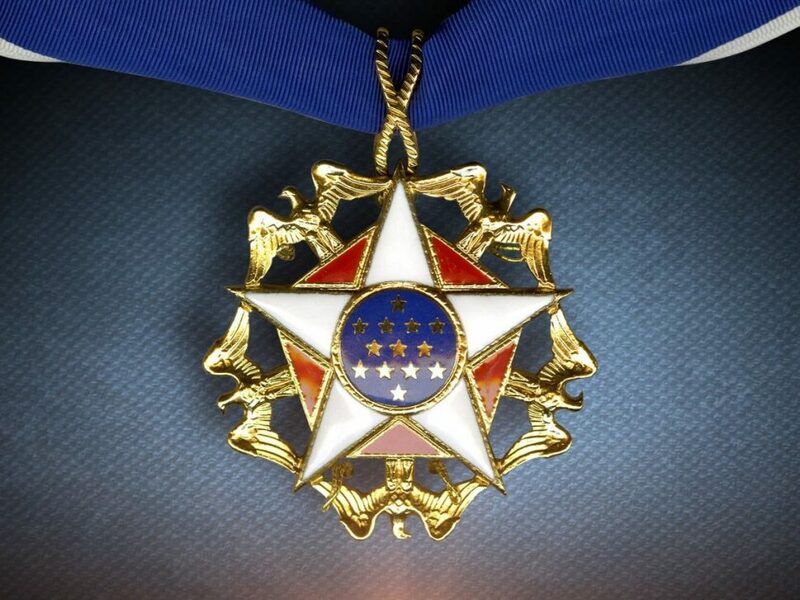 In fact, it’s an easy bet that none of this was mentioned when Ruth was given the Presidential Medal of Freedom today—along with his brother in excess, Elvis—in a White House ceremony. The reason is simple: the cover-up and all that led up to it more than matched the alleged crime. 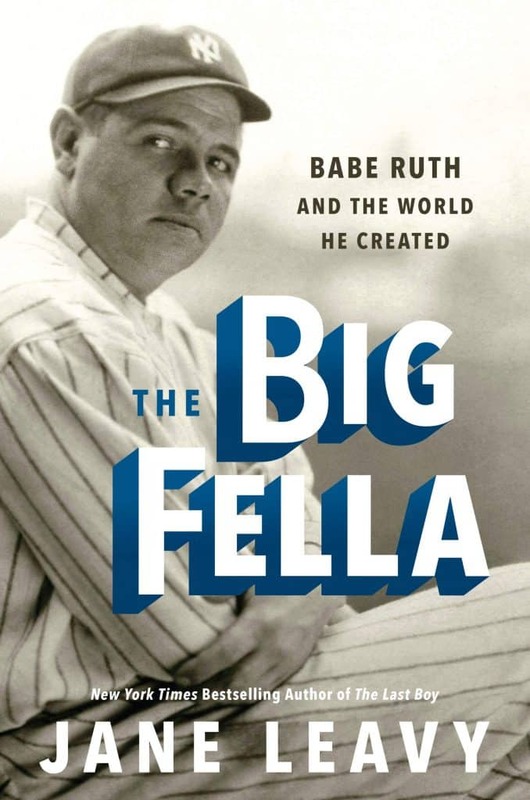 In her new book, “The Big Fella: Babe Ruth and The World He Created,” acclaimed author Jane Leavy excavated some Ruthian exploits to support her narrative that the Yankees’ Hall of Famer was the first true “celebrity athlete.” Someone who could get in and out of trouble before the phrase “damage control” was ever created. Author Jane Leavy argues that it’s incidents such Babe Ruth’s Long Beach arrest, and how it was handled,/spun, that secure his place as America’s first, modern sport celebrity. Long Beach gets its share of the Ruth spotlight based on some deft digging by Leavy, who produced more than 600 pages of work for this tome. While in Southern California recently to talk about the project, Leavy shared more about Ruth’s celebrity-induced visits to Long Beach and even exhumed more information in trying to be as historically accurate as possible about just who, what, where, when and how some of these things came about. First off: Whatever Ruth may or may not have done that was considered egregious, he was already trying to live down something that Yankees general manager Ed Barrow called the “only dumb play” of his baseball career. Late in October of ’26, Ruth starts a 12-week, 14-city tour of the Midwest and California, performing with the Pantages vaudeville theater chain, often making as much if not more from these appearances than he would make from his Yankees’ salary. The final performance was to circle around to Long Beach on Jan. 21, 1927. The show would follow a format that had worked before: there was newsreel highlights projected onto a large sheet showing Ruth’s on-the-field exploits, he would come bursting through the sheet, the audience would erupt, he’d start talking about himself, tell stories, perhaps do a song and dance. It ended when he would invite a half-dozen kids up to have them recite a poem or do a cute performance. Then he would send them off with autographed baseballs. There were three performances that day in Long Beach, the last an afternoon matinee. Yet, the restless Ruth somehow decided he wanted to go fishing in between. That could be arranged. In steps Glenn E. Thomas, owner of the largest Studebaker dealership in Long Beach, also a city councilman and early investor in Hancock Oil, and someone who knew how public relations works. And yes, it’s the same Glenn E. Thomas whose name resonates with car dealerships over the Long Beach, Signal Hill and Huntington Beach areas. Thomas sends him to a dealership in Riverside owned by his brother, Clare. The plan was to shoot some publicity photos, invite a local automobile reporter from the Riverside Enterprise, then they’d all go to the Rainbow Angling Club in San Bernardino. As the story goes, by the time Clare Thomas and the reporter met up with Ruth after the shoot, Ruth had already caught, cleaned and ate 17 trout, washing it down with … you know. But that was only half the problem. Ruth realized it was getting late and there was no way he could drive back to Long Beach “even in a Glenn E. Thomas Studebaker,” Leavy writes. The answer was to hire a local daredevil pilot who would charge them $20—well above the usual $2.50 fee—to make the 35-minute flight from San Bernardino to Long Beach. Just one problem: The guy’s plane had some fuselage issues. So as Ruth poured drinks for everyone on the running board of their Studebaker, someone cut into squares some Pillsbury bags that had been used for dishcloths and patched things up. So Ruth somehow gets back in time and in one piece. Leavy picks up the story: As Ruth is “juggling autographed baseballs” backstage at the regal 1,800-seat State Theater waiting for the show to start, someone delivers the news – he’s being served a warrant for his arrest on charges of “violating child labor laws” during a theater performance in San Diego seven days earlier. 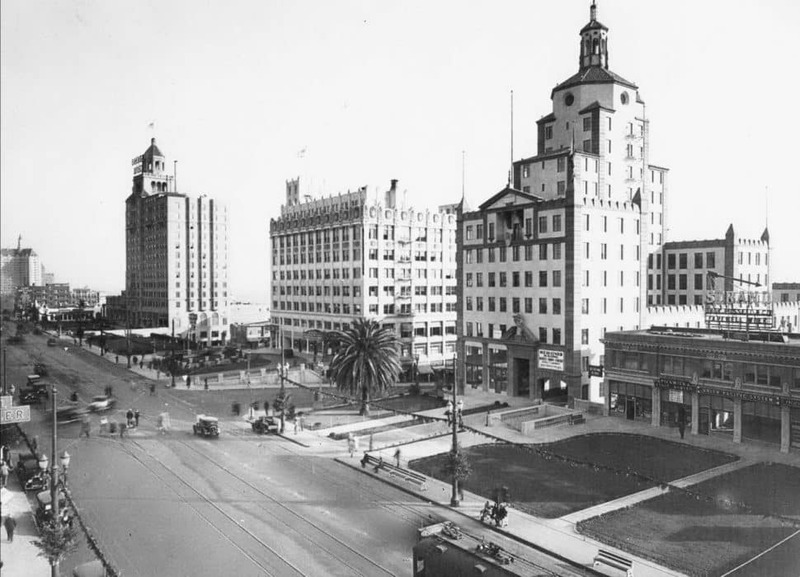 The State Theater occupied the first four floors of the eight-story Jergins Trust Building (middle), situated between the Breakers Hotel and the Ocean Center. A publicity-conscious deputy state labor commissioner named Stanley M. Gue drummed up charges that made Ruth responsible for an 8-year-old who already had the stage name of Baby Annette De Kirby being allowed to “perform” after the hour of 10 p.m. She was one of the kids who had come up and was part of Ruth’s act. 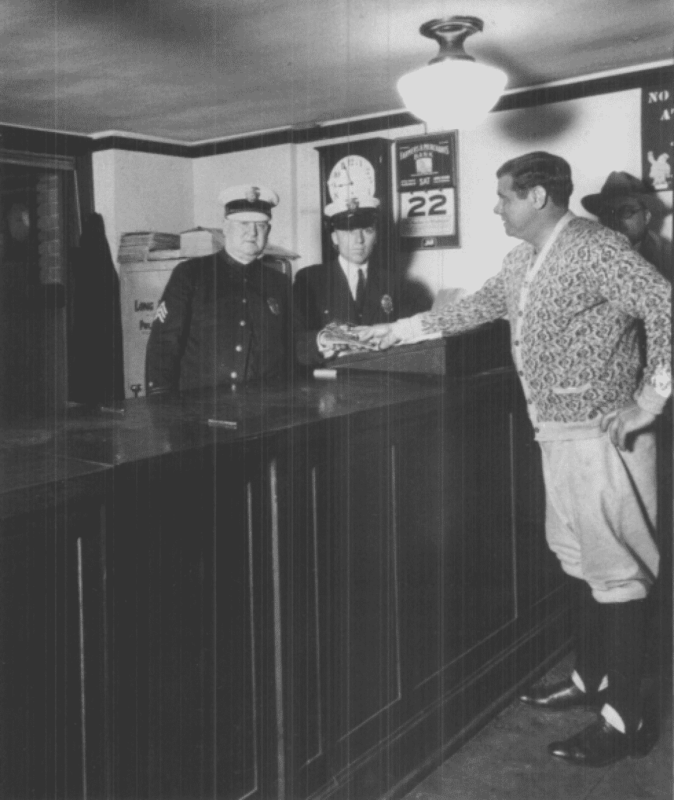 The Babe pays his fine to Long Beach Police sergeant Joe Hale. In today’s world, TMZ would be all over it. In the newspaper world of the 1920s, there was time to perform some rehab and spin by his handler, sportswriter-turned-publicist Christy Walsh, who was always by Ruth’s side. A trial date for The People of the State of California v. George Herman Ruth was set in Long Beach for Feb. 7—which also happened to be Ruth’s 33rd birthday. Walsh could fix that. First, a postponement. Next, Walsh created a diversion. He had already been trying to get Ruth to save some money as a nest egg without much success. Walsh decided that Ruth was going to announce, on his birthday, that he “was penalizing himself a thousand dollars for each year of misbehavior” and that would be put into a trust fund in New York. Ruth not only bought in, but he immediately put $33,000 into the “penalty” account—or $1,000 for each year of his existence. “Newspapers across the country trumpeted the news of a new era of fiscal responsibly,” Leavy writes. It also stirred up national sportswriters to come to Ruth’s defense. Damon Runyon decided that Ruth shouldn’t have to penalize himself because he “was wildly underpaid” by the Yankees. The team had just made him an offer of $52,000 deal, the same that he earned the previous three seasons, so the negations were played out in the press. With all that commotion, and Ruth returning to Los Angeles to make a movie at the new Wrigley Field ballpark not far from the Coliseum, his case was finally heard on Feb. 25. “It was once again safe to take American children to see Babe Ruth,” Leavy declared. “The claim this young girl was ‘employed’ was to say the least convenient,” Leavy elaborated. “But it was guaranteed publicity for Gue. By the time the May 1927 issue of “Studebaker Wheel” magazine came out, chronicling that crazy fishing trip, Leavy surmised “Ruth probably hadn’t seen the story.” Or cared. The Yankees’ 1927 season was one for the ages. Led by Ruth, Lou Gehrig and the rest of “Murderers Row” the team compiled an incredible 110-44 record, swept the Pirates in the World Series and is still used as a metaphor when one wants to quantify “the greatest” anything that happened in sports. But as was again the case, Major League Baseball was far away from the West Coast, which had its own professional league, the Pacific Coast League, and a team housed at this new Wrigley Field (opened in late 1925) called the Los Angeles Angels, an affiliate of the Wrigley-owned Chicago Cubs. 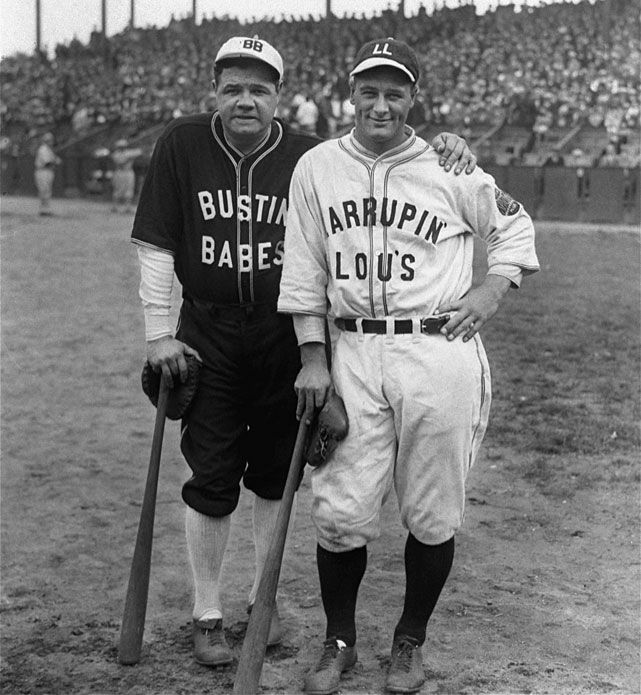 Ruth and Walsh knew that the West Coast was ripe to celebrate the big-league game played across the country, so Ruth and Gehrig came to them. Wrigley Field on 42nd Place and Avalon lasted until the mid-‘60s, a prime location for filming and TV shows. Now demolished, it has been converted into a senior center and a synthetic soccer field filling the entire square block, a half-mile East of the 110 Harbor Freeway. Another new ballpark in the area rose up from the local oil fields about that same time. It only lasted a few years, because of the 1929 Depression. With that came the construction of a 3,500-seat Shell Park diamond, at the corner of Hill Street and Obispo Avenue in Signal Hill, just off where Stearns Street runs into Redondo Ave. Ruth and teammate Lou Gehrig were told their 1927 next barnstorming tour would end at Shell Park, with an Oct. 31 exhibition, the day after playing before Hollywood stars at Wrigley Field. No need to worry about a visit to the State Theater this time. Unfortunately, the weather didn’t cooperate. The Long Beach area game was rained out. If not for a $12,000 insurance policy, the Ruth Tour could have had some financial problems reimbursing everyone for their troubles. But now, Ruth and Gehrig had time to kill, and trouble to avoid. They phoned Glenn E. Thomas again. Instead of fishing, the car magnate yielded to Gehrig’s desire to do some hunting. Thomas arranged for them to get over to the Farmers Gun Club, near the present site of the Long Alamitos Race Track. A publicist was, of course, included, as was a cameraman who would eventually film Ruth “passed out dead drunk in his duck blind, chin collapsed on his chest, thick hair matted and unkempt,” as Leavy wrote. The film actually turned up not long ago, and was shown at the Long Beach Police Historical Society. Word was, Thomas was afraid Ruth might accidentally shoot someone, having been handed a rifle and plenty of the liquid courage that served as all the ammunition that Ruth would normally need in that kind of situation. It’s not as if Ruth would need to be brought in by Long Beach police again to explain away another misunderstanding. It doesn’t mention anything about being able to down 17 trout at one sitting.